Various religions practice some form of meditation. What makes the meditation taught in the Bible different? How should a Christian meditate? God wants us to meditate—to focus our thoughts on important things for an eternal purpose. He shows us how and why a follower of Christ should learn the art of biblical meditation. Our 21st century is not likely to go down in history as the age of thinking. The age of distraction, of entertainment, of 24/7 technological connectivity, perhaps. But deep thinking? Not so much. Many people would rather inflict pain on themselves than spend 15 minutes with nothing to do but think, according to researchers at the University of Virginia and Harvard University. Two-thirds of the men and a quarter of the women in the study decided to shock themselves rather than just sit and think (U.S. National Institutes of Health). “Most people do not enjoy ‘just thinking’ and clearly prefer having something else to do,” said the report on the study published in the journal Science. Yet the Bible encourages a type of deep thinking that is very beneficial in this life—and even more in preparation for the next life. God wants us to meditate—to focus our thoughts on important things for an eternal purpose. He shows us how and why a follower of Christ should learn the art of biblical meditation. We’ve titled this article Christian meditation, but that is not to differentiate it from meditation in the Old Testament. The teaching of the Bible is consistent throughout. However, biblical meditation is quite different from Eastern meditation, New Age meditation or other spiritual or psychological forms of meditation. In many forms of meditation, people are told to empty their minds and focus on their breathing or on repeating a phrase or mantra. But the Bible teaches meditation that means filling our minds with God’s laws and His way. As the psalmist wrote, “Oh, how I love Your law! It is my meditation all the day. … I have more understanding than all my teachers, for Your testimonies are my meditation” (Psalm 119:97, 99). In addition to mentioning God’s commandments, other psalms refer to meditating on God’s works—His miracles and creative power—and His glorious splendor (Psalms 143:5; 145:5). Focusing on our great God helps us keep ourselves in perspective. And God remembers those who reverently meditate on His name—signifying His qualities and characteristics (for more on this, see the article “Names of God”). Under God’s inspiration, the prophet Malachi wrote, “Then those who feared the LORD spoke to one another, and the LORD listened and heard them; so a book of remembrance was written before Him for those who fear the LORD and who meditate on His name” (Malachi 3:16). The apostle Paul also listed helpful things for Christians to meditate about. “Finally, brethren, whatever things are true, whatever things are noble, whatever things are just, whatever things are pure, whatever things are lovely, whatever things are of good report, if there is any virtue and if there is anything praiseworthy—meditate on these things” (Philippians 4:8). It is fitting that the most positive being in the universe would encourage us to focus on the positive as well. Meditation as described in the Bible works in conjunction with other spiritual tools like prayer, Bible study and fasting to help strengthen our relationship with God. Of course, our concentrated thoughts themselves need guidance. We should pray for God’s Holy Spirit to direct our meditation and to help us to think as God thinks. For example, biblical prayer is our chance to talk to God. He doesn’t want us to just repeat prayers written by others, but to talk to Him about what is on our minds. However, by studying the sample prayer Jesus used to teach His disciples (Matthew 6:9-13, often called the Lord’s Prayer) and many other prayers in the Bible, we can see that our own prayers can benefit from concentrated thought. Of course, our concentrated thoughts themselves need guidance. We should pray for God’s Holy Spirit to direct our meditation and to help us to think as God thinks. Think about prayer. To praise God in fresh and heartfelt ways requires meditation on His works, His character, His promises and His plans. To seek His Kingdom with renewed fervency takes focused thought about the conditions in today’s world as well as the wonders of His government. To pray effectively for the needs of others and ourselves can take thoughtful preparation and perhaps list making. 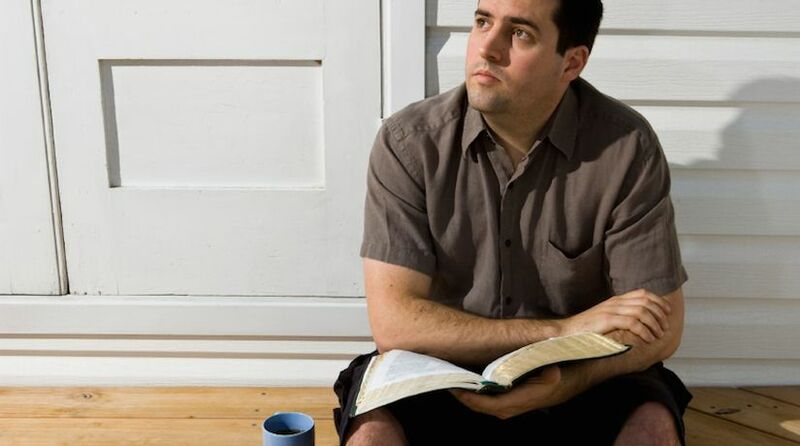 Bible study is also enhanced by periods of meditation—thinking about what we read in the Bible, how it relates to other passages we have read, and especially how it applies in our lives. We may gain knowledge by just reading the words of the Bible, but to grow in understanding, discernment and wisdom—to be “rightly dividing the word of truth” (2 Timothy 2:15)—takes diligent study and prayerful meditation. This type of study and meditation helps us fulfill the instruction in Proverbs 15:28: “The heart of the righteous studies how to answer” (see also 1 Peter 3:15). Fasting—not eating or drinking for a spiritual purpose—also provides an important occasion for meditation. When fasting, it is helpful to use the time for a combination of prayer, study and meditation. The difficult circumstances of a fast may cause our heads to hurt and our thoughts to wander to food and drink, but they may also help us concentrate in a powerful way on our weaknesses and God’s greatness. Growing in humility and reliance on God can be an important benefit of fasting with focused meditation. The Bible doesn’t teach meditation that is just for stress reduction or health or peace of mind (though these can be nice side benefits). Biblical meditation is designed to prepare us for action. We think right things so we will do right things. As Jesus Christ said, “For out of the abundance of the heart the mouth speaks. A good man out of the good treasure of his heart brings forth good things, and an evil man out of the evil treasure brings forth evil things” (Matthew 12:34-35). Christian meditation allows us to mentally practice righteousness. If we are mentally practicing what we should do in various situations, these right responses will more likely come to mind when we face trials and temptations. “Only be strong and very courageous, that you may observe to do according to all the law which Moses My servant commanded you; do not turn from it to the right hand or to the left, that you may prosper wherever you go. This Book of the Law shall not depart from your mouth, but you shall meditate in it day and night, that you may observe to do according to all that is written in it. For then you will make your way prosperous, and then you will have good success” (Joshua 1:7-8, emphasis added). Christian meditation is a spiritual tool to help us internalize God’s Word and way of life, to help write God’s laws on our hearts and minds (Hebrews 10:16). It is a key to understanding and applying God’s truth in every aspect of our lives. Do You Pray the Way Jesus Taught?